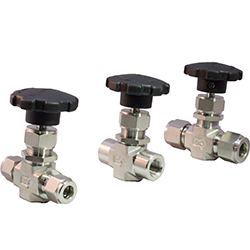 DK-LOK® forged body needle valves offer precise fluid system flow control with pressure capability up to 5,000 PSI. Hard chrome plated stem threads assure long service life with a choice of three stem types; metal to metal Vee stem, metal to metal Regulating stem and repetitive soft seat Kel-F stem for gas service. Available in 316 stainless steel, brass and monel with a variety of end connections such as reliable DK-Lok single or double ferrule compression tube fitting ends, female and male NPT and British Standard Pipe Tapered threads. Handles and stem packing options to meet your system requirements.